Print Book 564 pages in 1 volume (printed book) with downloadable forms Note: For print books, with MCLE's supplementation service, new supplements and revisions are mailed automatically with an invoice. If you do not want to subscribe, please check the opt out option during checkout. 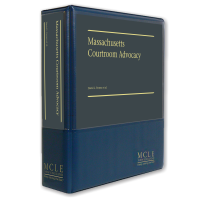 Massachusetts Courtroom Advocacy teaches you the tips, effective strategies and useful, practical techniques you need to advocate for your client in court. Featured are chapters on mediation and arbitration advocacy; jury matters; and extensive guidance on damages, as well as a chapter devoted to criminal practice. With a highly practical focus and incisive analysis of trial practice issues, this handbook is an essential resource for any Massachusetts litigator at any stage of his or her courtroom career. Thank you for updating your library with the 2017 edition of Massachusetts Courtroom Advocacy. This latest edition brings updated resources within your immediate reach—for fast, accurate, and practical answers to your questions. new checklists on topics such as witness preparation, information about the trial judge, depositions, objections, organization of evidence, and closing arguments. We trust you will find this latest version of Massachusetts Courtroom Advocacy an invaluable resource for your busy practice.